Ownerï¿½s cabin: With a King Sized central bed, the ownerï¿½s suite is for guests who wish to make the most of luxury on their sailing vacation. With large storage capacity from cupboards to shelving guests have everything they need in their cabin. Within, the Owners Suite there is a saloon area with a sofa, a large wardrobe and a desk with bookshelves. As mentioned all Cabins are en-suite, no exception here for the ownerï¿½s version. It is the largest of the bathrooms with two separate washbasins and a walk in shower accessed through a sliding glass door. Forward Starboard: The double cabin, accessed via a secure wooden door with a full length mirror from the front passageway, fitted with a queen size bed comes with an en suite modern bathroom with shower and electric toilet. There is plenty of storage with large space under the bed and cupboards around the cabin and a wardrobe. All cabins are equipped with blinds and mosquito nets on their portholes and they have power sockets to recharge the guestsï¿½ electrical appliances such as cameras, cell phones, tablets or laptops, and of course all cabins are fully air conditioned. 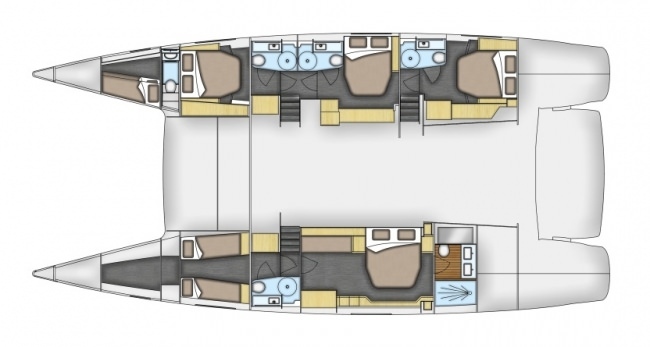 The Forward and Mid Starboard Cabins share a common staircase for access and the Aft Starboard Cabin has its own private access. Dive Info: LIR has 4 full sets of dive gear.